I still can't believe it's already been a month since I got back from Greece! I had the most amazing time in the Mediterranean and the timing could not have been more perfect. I just really needed to get away and make time for myself and people who matter most to me. The change in scenery felt so good and having plenty of time to get outside, be active, explore and learn about the culture was even better than I had hoped for. You can have a read and look back at my trip in my travel post where I share pictures, experiences and more. Naturally, being in Greece I was hoping to find natural skincare (as in, lots of stuff made with olive oil, obviously) but our finds exceeded even my own expectations. I thought I would share all the beauty bits I picked up because I'm always curious when it comes to travel hauls and whatnot. The Greeks are very proud of their olive oil and with reason. Not only will you find this oil in basically every meal (the dishes were amazing and there was always a vegan option to choose from! ), but using it externally is also one of the best things you can do for your skin. In Santorini, there were so many shops carrying natural products and myself and my travel buddies could not resist treating ourselves to a few things. We came across Venus Secrets, a natural skincare brand 'Invented by the Gods' void of parabens, silicone and mineral oil and that contains plant derived and organic ingredients. They carry many products, with olive oil and aloe vera making up their base, and come in various scents. We were just oohing and aahing every time we took a sniff and thus spent way too much time in the store trying to decide which ones to get. 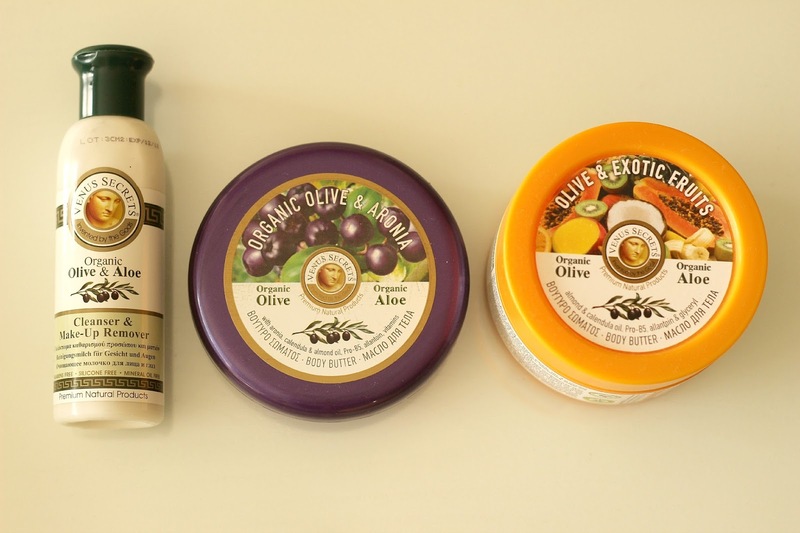 I finally settled for the Organic Olive & Aronia Body Butter, the Organic Olive & Exotic Fruits Body Butter and the Organic Olive & Aloe Cleanser & Make-Up Remover. 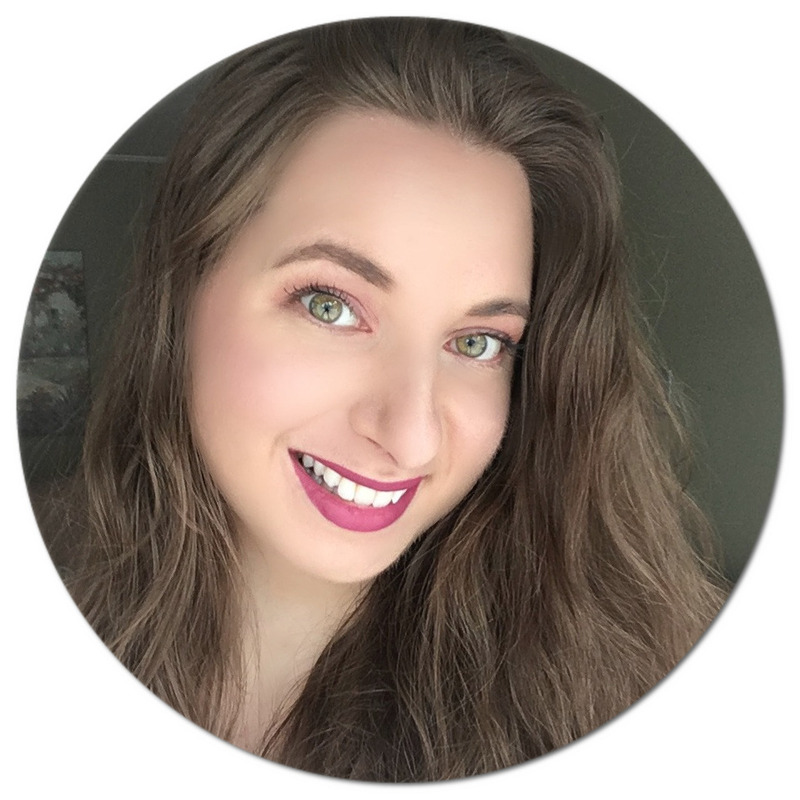 I got so excited when I found out they had an online shop, so you can have a look at all the amazing products they sell. Most Greek shops we visited also carry many pure olive oil soaps and I of course had to fill a bag up with bars to give away as souvenirs to my friends. I naturally had to get a few extras for myself and kept one pomegranate scented soap from Aphrodite Skincare and another that came with a ruin magnet stuck to it (how cute right?). I also kept seeing natural sea sponges everywhere and I was really curious to try one - think of them as an earth friendly alternative to synthetic loofahs. The former are sustainably harvested (as they have actually been shown to promote growth colonies we were told), vegan friendly and biodegradable. I was surprisingly very good with my purchases and actually ended up having too many euros leftover. To make up for this 'problem', I knew I had to spend the rest on something in duty free at the airport and decided to splurge on the See By Chloe perfume and also purchased a novel, The Island by Victoria Hislop. When I read on the back of the book that the story takes place in Greece, I was sold. 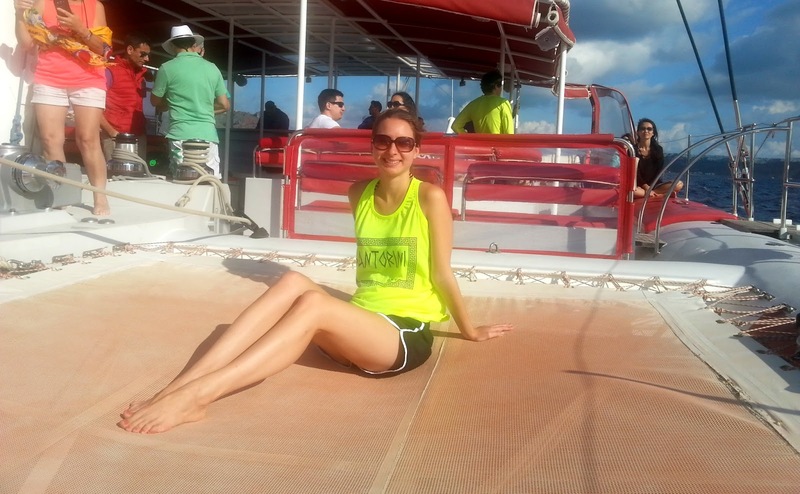 I also picked up this neon green Santorini printed muscle tank and two pairs of TOMS shoes since a shop we found in Santorini sold them for unbelievable cheap. I've only ever owned TOMS knock offs but these were actually cheaper than what I had previously spent on look a likes! What do you enjoying treating yourself to when on holiday? Sounds like you had an amazing trip! 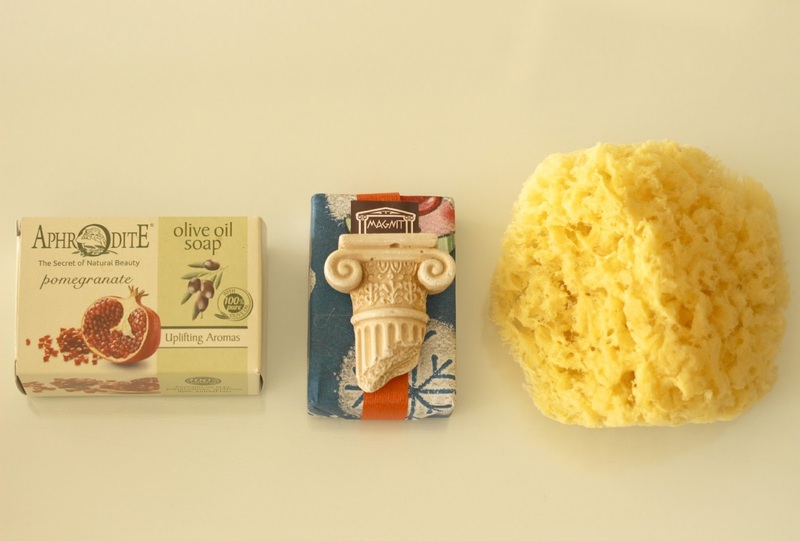 Those olive oil soaps sound lovely, I bet they are so super moisturizing! Oh my gosh Greece! I want to go one day. I am totally intrigued by the natural sea sponge. Those soaps are adorable! Ah! International products are so exciting!! 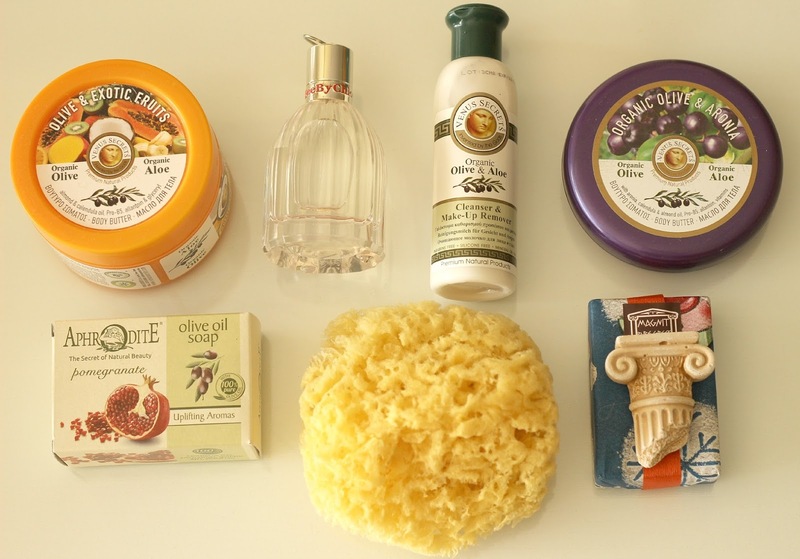 I really like the looks of the olive oil soaps! They sound like they would surely cure dry skin!